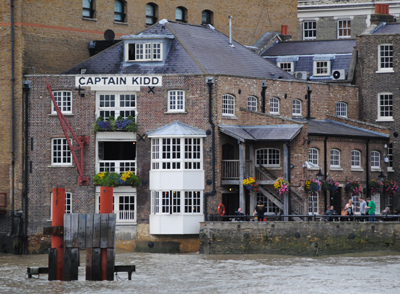 Located on the north bank of the River Thames in Wapping, East London, this pub owes its name to the infamous mariner who met his end at nearby Execution Dock. Located in what was originally a warehouse, the pub – one of several riverside pubs in Wapping – only apparently dates from the 1980s but the historic location – and the ample views it provides over the river from its garden area – ensures it still has plenty of atmosphere. 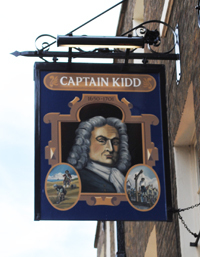 Captain William Kidd himself was a Scot, born in 1645, who took to the seas in the Caribbean where he operated as a privateer. It was during a voyage in the Indian Ocean – he had set off from London in 1696 – that he undertook actions which led him to being accused of murder and piracy, something he discovered upon his return to the Caribbean soon after. He traveled to the North American city of Boston to plead his case with the governor but was instead arrested and eventually sent to England where he stood trial for piracy and murder. He was found guilty on all charges and was hanged on 23rd May, 1701, at Execution Dock – believed to have been located just to the west of the pub – in Wapping. It was apparently a messy affair – the hangman’s rope broke on the first attempt and he was only successfully hanged on the second. Kidd’s tar-covered body was later displayed in a gibbet hung over the Thames at Tilbury Point as a warning to other pirates for three years. Kidd’s fame grew after his death, thanks in large part to rumours he’d left buried treasure someone in the US, and his name has become somewhat synonymous with piracy ever since. The pub, at 108 Wapping High Street, is operated by Samuel Smith’s.